Ricochet Robot , Alex Randolph, Hans im Glück/Rio Grande Games, 1999. Categories: board, family, strategy, puzzles, bidding, timer, logic & deduction. Ricochet Robot is a tough game for people whoenjoy puzzles.Like Boggle and other word cube games, Ricochet Robot requires players to analyze a randomlygenerated board, find a solution, and score a point.Players are racing against the timer and each other.Although this is not a strategy game, and some have derided this game for what it is,players who enjoy beat-the-clock games will enjoy this gem from Alex Randolph. The rules are simple.The object is to get a robot of a given color to its goal in the time alloted.Four double-sided boards form the playing field.The boards abut in different combinations to alter the playing field with each game.Various colored symbols are scattered around the boardsalong with walls and a large central barrier.The four colored robots are randomly scattered on the board to begin the game. 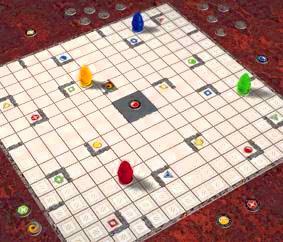 A random token is uncovered to determine the goal and to begin the round.Players can move any of the four robots along the ranks: the same as a rook in Chess.Unlike a rook, the robot must move as far as it can until itcrashes into a wall or another robot.Using combinations of robots and wacky routes around the board, playersdesperately race each other to find a solution.Once realized, the player shouts out the number of moves required for the solutionand turns over the egg timer.Other players have exactly one minute tocome up with another solution and shout out the number of moves required.When the timer runs out, the lowest biddergets to demonstrate their solution to the other players.If the solution is valid and equal or less than the bid,the player scores a point and gets to keep the token tokeep track of the score. What is interesting is secondary bids are not always lower than the original bid.Players sometimes bid higher in the hope that the original player cannotdemonstrate a solution.If this is the case, the next highest bid attempts to win the point.If two or more players have an identical bid, the player in lastplace gets to show the solution.This rule helps the last place player keep up with the leaders.Since the solutions are sometimes obvious, this rulealso keeps players involved and struggling to see the solutionbefore the timer runs out. When playing Ricochet Robot it is importantfor players to agree on certain protocols not mentioned in the rules.For instance, if a token is revealed that requires one simple move,I suggest the round be declared void, and the token reshuffled into the mix.The Rio Grande Games rules for this game require that a robot move left or rightbefore taking the goal.This requirement rules out a bid of one, but experienced playersreflexively bid three, knowing that the robot can move on the goal,off in another direction, and back onto the goal.Another area for protocol requires players to actually have a solution before bidding.As pointed out in the rec.games.board forum,the game leader could bid immediately some ridiculously high amount in orderto start the timer and short-change the other players.When the timer runs out, the leader can futz with the robots until a solution appears.Our group plays with etiquette to rule out this behavior. Since this game is so mentally intense, another area for protocol involvesthe behavior of the player's behavior during the playing round.Our gaming group is especially competitive with this game,and the bidding and the scoring is always close and quick.During the game, one player would disrupt my concentration bywhispering a mental count, pointing with his fingers,and nodding with his head.To counter these distracting actions, I also started moving my head from side to side,and nodding up and down as I visualized my moves.Although we played several rounds with me gesticulating with my head like abreak-dancer, my nemesis finally broke down and shouted "STOP IT WITH THE HEAD. "What's funny is that everyone noticed my actions, but no one mentioned thembecause they were so immersed in the game.The meta gaming etiquette point was taken, and everyone in ourgroup now sits silently and motionlessly while figuring out a solutionand waiting for the timer to run out. Many in our gaming group are engineers and are fascinated by the process bywhich the human mind assembles a solution.We've noticed that complete solutions are often assembled in parts.Sometimes the goal is reachable if only a certain path is blocked.Thus the solution requires two stages: assembling the path blockerand getting the appropriate color robot to the goal.Or getting to the goal may require three robots and thesolution requires three stages: getting two random robots to forma traffic jam while the third tags the goal.Each of these stages often require two or three attempts before being solved.So, it is interesting how the mind can hold a solution forone or more stages while trying two or three solutions for another.Often when the winning move is revealed, you see congruence with other playersin some stages and alternate solutions for other stages.We have fun post-analyzing and comparing the solutions. Strategy gamers may pooh-pooh this game, but I thinkAlex Randolph has designed a great social game.Since 10 or 20 players can play at once, this is a useful gameto have in the game closet for when large groups want to play together.Our group has found that people love to spectate at this game as well.Whether spectating or playing, everyone agrees thatthe timer and the complexity of the visualization make thisa mental barn-burner.Many have walked away feeling frazzled and in need of a beer. Randolph, who was born in 1922, has over 80 game designs tohis name, including such classics as Twixt (1962)and Oh-Wa-Ree (1962).More recent popular Randolph designs include Hols der Geier (1988), Jagd der Vampire (1991), In Teufel's Küche (1993), and Halunken und Spelunken (1997).This man has been releasing excellent game designs for nearly 40 years!Unlike Sid Sackson and Reiner Knizia, Randolph appears under-appreciated,especially in light of the fun we are having with this game.Recommended for people who like timed puzzles and social games. [an error occurred while processing this directive]Last modified: Thursday, 09-Jun-2011 12:36:59 MST.